Sunny Gilbert (Van Dessel Factory Team) and Kerry Werner (Kona Maxxis Shimano) took the wins on the penultimate day of the Parkway CX trophy, with Gilbert edging it in a sprint and Werner dominating all race. The early leaders from Charm City Cross in the Parkway CX Trophy series were Kaitie Keough (Cannondale p/b CyclocrossWorld) for the Elite Women and Werner for the Elite Men. 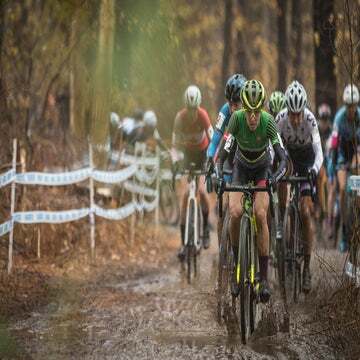 Keough was not competing at DCCX, so the women’s title is up for grabs on Sunday at DCCX, with Rebecca Fahringer (Kona Maxxis Shimano) now holding a slim 30-second lead over Gilbert. Werner leads the series for Elite Men by a large margin. Racing started hard, with Gilbert taking the holeshot, looking to take the payout offered by sponsor Rapha for the fastest ride on the first lap, which she went on to claim. On lap two, Fahringer caught and passed Gilbert, taking the front of the race. 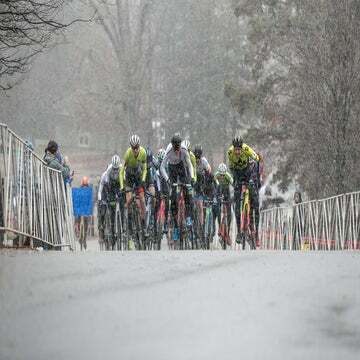 Behind, the chase group was whittled to five riders, with Gilbert pulling Carla Williams (Deschutes Brewery), Erica Zaveta (Garneau-Easton p/b TLC), Lily Williams (The Pony Shop p/b KPMG), and Raylin Nuss (Gateway Harley-Davidson Trek). Gilbert’s strength was evident as she re-caught Fahringer at the front in the third lap. The pair were the equal of each other throughout the rest of the race, playing cat and mouse for three laps. Gilbert tried a final attack on the stairs in the last lap, but Fahringer countered on the way past the pits. It came down to a sprint, with Gilbert taking the win by a bike wheel in 42:14. “She was actually hitting the straightaways better than I was, just hammering, throwing down the power. Actually, that is why I did not think I would win,” said Gilbert. “But last lap she made some mistakes. I was able to take the lead a couple of times and a couple of bike lengths a couple of times. She would always attack right back. We were both in it to win it. “I was drafting about half that finishing straightaway, and then I just came to the left, threw in a dig and even threw the bike,” the winner said. Behind the lead pair, Caroline Nolan (Voler / Easton / HRS / Rock Lobster) had caught the chase group, and then made her own move into third place with two to go. Werner took the lead from the gun, and after the first two laps, was holding a 10-second lead over a small group that included Travis Livermon (The Endurance Collective), Eric Thompson (MSPEEDWAX), Merwin Davis (Cycle-Smart), Tyler Cloutier (TCCX), and Chris Aitken (Focus Attaquer CX Team). Werner’s strength was evident as he went on to stretch his lead by another 15 seconds in the next two laps. In the chase group, Cloutier and Livermon attacked but failed to shake the group. However, Livermon tried again, this time drawing Thompson with him, with Cloutier unable to follow. The pair closed down the gap to Werner in three laps to just 10 seconds, but couldn’t manage to reel him in. Werner took the win in 1:00:33. Livermon took second place, just nine seconds back, with Thompson a further 10 seconds behind him.